This estate, which has had problems with musty barrels over recent vintages, seems to have rectified that problem. This estate, which has had problems with musty barrels over recent vintages, seems to have rectified that problem. Dark ruby/purple-colored with Certan de May's tell-tale roasted peanut, herbal, black-cherry, curranty-scented nose, this wine is reminiscent of the fleshy, open-knit 1983. There is moderate tannin, but the wine is surprisingly forward, soft, and texturally appealing. 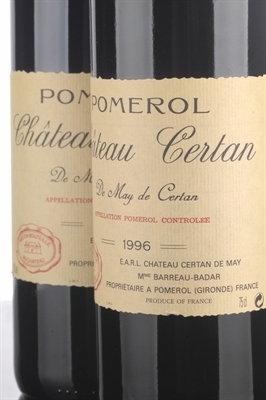 However, readers must be willing to tolerate a strong herbaceousness to enjoy this 1994. It will drink well for 10-12 years.